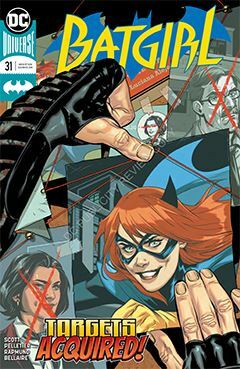 Batgirl is on the trail of a trained assassin named Cormorant. His current target is congressional candidate Luciana Alejo, so Barbara Gordon has volunteered to keep an eye on the campaign from the inside. Her computer expertise as earned her entry into the inner circle, rubbing shoulders with head of security Jason Bard (whom she doesn’t trust) and volunteer coordinator Izzy (whom she doesn’t like). When Cormorant’s latest assassination attempt goes south, Batgirl takes to battle to the opponent, who claims to be completely uninvolved. If that’s so, who would benefit from Alejo’s death? Given that one of her causes would be the closing of Blackgate Prison in favor of a higher security facility, any criminal might have an ax to grind. What we have here is less of a typical super-hero story, of people in tights and masks beating each other up, and more of a mystery, and I DO love a mystery. Barbara could easily be a private investigator trying to catch a gun for hire, and I’m okay with that. Though not perfect, the writing has been strong and the artwork superb in the time I’ve been reading this series, maintaining a consistent quality that is nothing short of refreshing. In this era where more emphasis is paid to the writer, and less to the artist(s), this series keeps me coming back for more, month after month.